A big new app that’s landed for the iPhone is Kicksend, and if you do a lot of file sharing among your colleagues, then you’ll be very, very happy to hear about this one’s existence. Why? Because it’s about to make big file transfers surprisingly simple. Kicksend, recently released for iPhone, is designed to be a kind of file-sharing tool for those out there who aren’t technically inclined, yet need to be for the sake of their business. And with Kicksend, not only will you be able to take the various files on your iPhone–photos, videos, presentation files, songs, what have you–and send them out, but you’ll also be able to send them to multiple people, and across a variety of platforms, from desktop to web app to mobile. Now, what this means for your small business is actually going to vary depending on what you do. 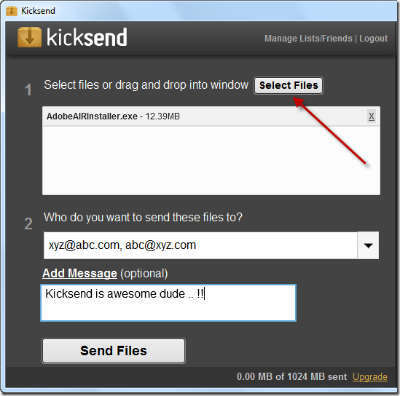 If you deal with large quantities of files, then Kicksend is going to be a godsend. Take a lot of videos, like home tours in a real estate tours? You’ll be able to move them all rapidly from your iPhone to your desktop for later use. Take a lot of pictures? Well, you’re not alone there–even Annie Leibowitz has expressed her fondness for the iPhone 4S camera–but now, you’ll be able to rapidly move your files from your phone. Same thing with any other files. And as it turns out, Kicksend is surprisingly easy to use, which is the kind of thing that’s going to make this very welcome for those who deal with lots of files. And best of all, Kicksend is a free app. Yes, you’ll be able to do all those file transfers completely free. This in turn is going to give you a lot more opportunity to introduce pictures, videos and even presentation files into your web presence, which will in turn spur people to attempt to make contact with you. And that’s where you’ll need a solid communications platform, featuring cloud-based telephony with hunt groups all backed up by a toll-free number to make it easy for them to get in touch with you. Half the job is getting people to find you. The other half is making them want to stick around. This entry was posted in Halloo, Small Business, Virtual Office by Steve. Bookmark the permalink.